Season 4? Or is it over after this? I think with all of this boundlessly optimistic tea leaf reading, we’re destined to end up with a board full of profoundly disappointed fans. I love The Return, but I'm so hesitant about all this. I can't deny I would be open to, and excited for, a potential season 4. But I can't help thinking that a further continuation could leave all the really poignant themes of finality and loss in season 3 a little less potent. In my opinion the story's ended perfectly. It's so thematically sound and resonant. I know deep down that I really don't want any more. I was proved wrong worrying that the Laura Palmer story (as we knew it at the time) had no mileage left, so I could be proved wrong again. I hope so. Mr. Reindeer wrote: I think with all of this boundlessly optimistic tea leaf reading, we’re destined to end up with a board full of profoundly disappointed fans. I Agree with you! At the beginning, i hadn,t understand good your message, but now yes. Last edited by Harry S. Truman on Thu Sep 13, 2018 9:19 am, edited 1 time in total. I would love to see another season, but if there's nothing more, I'm just happy we got Season 3. We got the show back against all odds after 25+ years of David Lynch saying it was dead as a doornail, it was a major critical success and now he's not saying boo one way or another about more. Define 'boundlessly optimistic'. I’m just seeing a lot of speculation based on absolutely no evidence. For instance, as AgentEcho pointed out, people are reading a lot into the fact that actors are still doing appearances for the show, which doesn’t really mean much at all. But don’t mind me, I’ve found myself well served in life by low expectations, and because of that I can be a Debbie downer sometimes. I think we have at least a 50% shot of seeing more TP before all is said and done. I just personally don’t see any reason to believe it’s imminently forthcoming. That being said, there also isn't much evidence that it ISN’T imminently forthcoming, aside from denials which are pretty meaningless. Time will tell, and I’d be thrilled to be proven wrong. You all have your fun. Sorry to intrude. Trudy Chelgren wrote: I love The Return, but I'm so hesitant about all this. I can't deny I would be open to, and excited for, a potential season 4. But I can't help thinking that a further continuation could leave all the really poignant themes of finality and loss in season 3 a little less potent. In my opinion the story's ended perfectly. It's so thematically sound and resonant. I know deep down that I really don't want any more. The Season 2 finale, FWWM, and Part 18 of the Return are all perfect endings to the saga in their own ways. I have no doubt that, if Lynch and Frost choose to continue their story, they'll find a way to make it work and not have it feel tacked-on. Lynch told an actor who didn't have much screen time to not worry, he'll have more next season. So, unless he was simply placating him, it's nice to know it's at least or was on his radar. The gang seems keen but I have to wonder if Showtime is willing to throw as much money into the pot this time around. I think anything could happen and Lynch has the ultimate freedom. If an agreement can't be made then at least Lynch/Frost got on full season under their belt done the way they wanted it done. Jerry Horne wrote: Lynch told an actor who didn't have much screen time to not worry, he'll have more next season. So, unless he was simply placating him, it's nice to know it's at least or was on his radar. I don,t understand this situation Jerry! All this, do we were very hope in a annoucement of a Fourth season, y now this last message your is a lot of pessimistic. It Was a joke all you has said in this fórum and in twiter?? 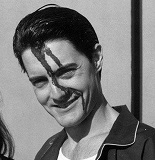 Jerry Horne wrote: Lynch told an actor who didn't have much screen time to not worry, he'll have more next season. No, whilst shooting. Not Ray. Everyone apparently wants it to happen. I have a feeling money is the only issue at this point. money may be an issue but there still seems to be real commitment from showtime to keep lynch happy and keep the door open for him. why else be a sponsor for the festival of disruption? networks, even pay cable ones, are pretty cynical beasts. Any idea if the amount of production time allotted is an issue? I remember him saying on the documentary that he didn't ever want to work with such time constraints again because there wasn't much time for exploration. Though, I guess production schedule is probably tied in to money as well. My very first thought when the promotion continued after S3 was that they were buying time and keeping the show fresh in people's mind (perhaps at the behest of Showtime) during the long writing process. Even Lynch warned us this would take years. Jerry Horne wrote: My very first thought when the promotion continued after S3 was that they were buying time and keeping the show fresh in people's mind (perhaps at the behest of Showtime) during the long writing process. Even Lynch warned us this would take years. you may be on to something. despite what some said upthread, these aren't your standard convention appearances from actors. there's lots of showtime promotion for them. the tour of australia and new zealand featuring cast members and the executive producer isn't a regular thing that happens with shows a year after they ended.